Article looking at the formation of the Palestinian working class, and the creation of the Israeli state. The calvary of primitive accumulation or rather its Palestinian re-enactment, which is only the most striking act of a drama which has affected the entire region, dates back to the middle of the last century. It began in the year 1858 when the Ottoman Empire, to which Palestine and the other countries of the Near East belonged, promulgated its law on landed property. The only way this archaic and antiquated empire could compete with the modern powers of Europe, albeit briefly, was by accentuating its pressure on the peasant masses. The object of this law was to replace traditional collective or tribal ownership with individual land ownership. Rather than being paid collectively, taxes were henceforth to be levied on individuals. In the case of defaulted payment the individual would be held responsible, thereby weakening any resistance to the increased tax burden imposed by the state. The peasants who shared the fruits and the use of the land according to the rules of village or tribal organisation, reacted in various ways to the new law. Some simply refused to conform to the law and never had their lands registered. At the time of the creation of the Israeli state in 1948, they were expelled from their lands on the pretext that they had no proof of ownership. Others included in their declaration to the state only that third which was cultivated annually, omitting the two-thirds that lay fallow. Still others registered an area less than the cultivated part, knowing well that the Ottoman state was not able to exercise effective control over everyone. Finally numerous villages registered their whole territory in the name of the village chiefs since they paid less tax or were exempt from taxation. The latter took advantage of the customs of the empire, whose immense size compelled the central power to buy off the village chiefs in order to dissuade them from assuming the leadership of peasant revolts. Consequently the enforcement of the Ottoman Code led to a strengthening of the role of the village chiefs. Originally they became landowners «to render a service» to the peasants, but the day would surely come when their heirs would try to profit from this distinction that nobody had wanted. For its part, the state decided to apply that rule of the code by virtue of which lands without owners (in fact the fallow lands or any that had not been declared) should be considered property of the empire (called miri) and on the strength of this legal title began to sell land from vast estates to Lebanese, Syrian, Egyptian and Iranian merchants. These attempted to take over effective possession of the lands, with varied success depending on the degree of resistance by the peasants. Those who were not successful retained their titles to the land which they sold to Zionist organisations a few years later at quite handsome prices. This process resulted in a growing concentration of landed property although the economic structures had not yet undergone any profound transformation, the peasants generally retaining actual possession of the land even if they had now no more than partial legal ownership. Such was the general situation on the eve of World War I. By the time it was over the Ottoman Empire had to give way to Great Britain. England's interest in Palestine was twofold: to control the strategic region around the Suez Canal and to prevent the emergence of a large anti-imperialist national movement by creating a puppet-state to divide the zone where sentiment for national unity was awakening. British imperialism's policy converged with the interests of Zionist capital to culminate in a common plan for the creation of that state, as both a local policeman and a colonial enterprise. Zionist capital had already attempted to set up colonies in Palestine before the collapse of the Ottoman Empire. Yet it was only able to implement its plan on a large scale under the British mandate, in particular with assistance from the Rothschild Foundation3, this time thoroughly transforming the relations of production. The purchase of land by the Jewish Colonisation Association, which was founded for that purpose, could naturally mean nothing other than the eviction of the Palestinian sharecroppers and farmers. In reality even though the deeds to this land were held by the large absentee landlords who willingly sold most of it in the first few years after the war (see Table I), the land which carried these deeds remained the indispensable source of the Palestinian peasants' livelihood. Source:A. Granoti, The Land System in Palestine. London, 1962. The dispossessed fellah had to become an agricultural labourer on his own land. The fierce exploitation of local manpower by Zionist capital at the beginning of the century was further exacerbated by the principle of Jewish Labour designed to preserve the colonial settlement project. This principle entitled the immigrants to expel the fellahin from their jobs while the Zionist fund financed the difference in wages in order to facilitate the employment of European labour power. This situation could not continue, long without violent confrontations because the expelled peasants were left only with the certainty of a slow death while they watched the colonists occupy their land. For this reason there have been nearly permanent social revolts from 1921, 1925, 1929, 1933, 1936 to the present. In 1921, three years after the British arrival, the situation had become so acute that a serious uprising spread throughout the country. The areas most affected were Safad in the north, and Hebron and Jerusalem in the centre. The peasants' wrath was directed essentially against the Zionists, whose settlements were hard hit. The English army assumed the task of restoring law and order; it has always shown enthusiasm for this kind of mission. With honourable intent to be sure, it suppressed the irresponsible minority by means of summary executions, hangings, etc. The uprisings reached their climax in the 1936 revolts, which lasted three years and were accompanied by a magnificent six month general strike in the towns. The motive force of this uprising was no longer the peasantry or the bourgeoisie, but for the first time an agricultural proletariat deprived of means of labour and subsistence, along with an embryo of a working class concentrated essentially in the ports and in the oil refinery at Haïfa. It should be noted that this movement was initiated in the towns and subsequently spread to the countryside where a guerrilla force took shape, attacking Palestinian landowners as well as the English and Zionist colonists. In fact numerous landlords were attacked by the Palestinian revolutionaries because they had sold their land to the Zionists. For the dispossessed peasants it was clear that the land speculators were getting rich on their impoverishment. Because of the Stalinist counterrevolution and the absence of a revolutionary proletarian movement in Europe capable of giving assistance, the Palestinian revolt was left to face the war machine of British imperialism alone. Nonetheless the British were compelled to supplement the terror of their weaponry with promises of independence and other similar manoeuvres in order to put an end to the revolt. Even the Arab feudal chiefs and the petty kings of the region in their pay had to be called on to help. These made a fraternal appeal to the Palestinians to silence their guns and to trust the good intentions of His Majesty's government. And in order to help them understand this appeal better, the borders of the Transjordan (where Prince Abdallah, the grandfather of the present-day butcher of Amman reigned; he was murdered by a Palestinian in 1952) were closed to any insurgents who tried to take refuge or procure arms and provisions there, as well as to any volunteers who tried to join the revolt from the Transjordan. The laws on collective responsibility in the Arab villages and districts, those terrorist delicacies which semi-barbarian Oriental despotism bequeathed to the civilisation of western capitalism, date from this period. Under these laws the village inhabitants are forced to provide accommodation for police detachments on punitive missions and the whole population is held responsible for operations carried out by anyone in the region. Thus the population is subject to martial law and enjoys the right to see houses where rebels have taken refuge destroyed and to undergo imprisonment as a deterrent. Thus, following an operation that cut telephone lines in Galilee, three villages were occupied by the British army. All the men were lined up. As they were counted, those who had the misfortune of being number 10, 20, 30, etc. were shot in front of the whole village. With these methods, Christian and democratic England intended to put down the revolt of the land less, bread less and jobless peasants. A population which did not exceed 800,000 was placed under the control of 30,000 soldiers! All the strike leaders were imprisoned. The feudal and religious leaders who assumed the leadership of the movement gave the colonists decisive help: in liaison with Prince Abdallah of such sinister memory they continued to stab the struggle in the back, participating with the English in the quest for a «solution» to the situation. The British launched a major offensive during which the insurgent villages were bombarded (an example followed by the Israelis today) leaving a total of 5,000 Palestinians dead and 2,500 imprisoned4. The heroic spirit of the Palestinian workers and peasants in those years was broken. The terrible isolation to which the international situation condemned their revolt prevented any broadening of its horizon that would have enabled it to converge with the struggle of all the exploited masses of the region against the colonial yoke and the old order. It was also paralysed by the weight of the social backwardness in which the country vegetated and which translated into the half-feudal half-religious leadership of the movement. The working class was unable to play a more important role because the party that claimed to represent it, the Palestinian Communist Party, was guided by a completely false orientation, which was further aggravated by an International that had nothing communist about it except the name. Far from being able to make its opposition to the reactionary religious leadership clear, the PCP, whose militants included a majority of anti-Zionist Jewish workers as well as a minority of Arab workers, was compelled by the Stalinized International to support the mufti of Palestine, Hadj Amin Husseini, a sort of Khomeini before the fact, if not worse. This disoriented the proletariat completely and fostered the development of nationalist tendencies on both sides. The Arab workers, finding that their party supported the most reactionary wing of the movement, left it to join less moderate nationalist organisations. For their part, the Jewish workers could not support such a position without finding themselves totally disarmed in the face of the deceitful anti-feudal propaganda of Zionism. Here as elsewhere, the Stalinist counterrevolution completely destroyed the class party, with greater ease in Palestine insofar as the proletariat there was still embryonic and above all terribly divided as a consequence of the colonial situation. The revolt of 1933-1936, courageous as it was, ended in a complete fiasco. In spite of the momentary retreat by Great Britain which was obliged to limit Jewish immigration for a few years, the Zionist movement became stronger and stronger. The Palestinian movement itself foundered in such bitterness and deception that it can be said without hesitation that the painful outcome of the war in 1948 had already been partly determined in 1936. At the end of the Second World War the old English empire began to give way to the American imperialist colossus. The Zionist movement was all the better for it since the English presence had become uncomfortable and even intolerable, inducing several Zionist groups in a hurry to establish their own state to initiate an anti-English terrorist movement, in which Begin earned his spurs. By this time Great Britain wished only to relinquish its responsibility for Palestine, and it tossed the hot potato to the U.N., that new den of thieyes built on the ashes of the defunct League of Nations. The preparations for the formation of a Jewish state led to the Israeli Arab war of 1947. On May 14, 1948, while the delegates of the virtuous bourgeois nations lounged in the sumptuous rooms of the U.N. babbling on about whether an Arab and a Jew were capable of living together without going for each others' throats (with these Orientals, my dear, one never knows...) or whether it might be better to separate them with barbed wire, the state of Israel was created. This resulted in a race between Truman and Stalin to see which would recognise the new state first, and in particular, it opened the hunting season on Palestinians. Up to this time history had only given a foretaste of capitalist barbarity. Now the avowed objective was to rid the country of as many ruined peasants as possible. This would be the re-enactment on a grand scale of the calvary of the Scottish peasants documented by Marx: the clearance and dispersion of the people is pursued by the proprietors [in this case the Zionists] as a settled principle, as an agricultural necessity, just as trees and brushwood are cleared from the wastes of America or Australia; and the operation goes on in a quiet, businesslike way, etc.5. For international and local reasons Israel was not able to occupy all of Palestine just then. In fact, the process of expropriation was less advanced in some areas than others. The mountainous central region was less interesting to the Zionists, and furthermore the state of Israel was allowed to establish itself only on part of Palestine within a framework of a partition advocated by the U.N. However the portion actually occupied was larger than the partition plan provided for, even though the West Bank and Gaza Strip escaped the Zionist conquest for the moment, the former falling to Prince Abdallah (who on this occasion was made king of Jordan by the English), the latter going to Egypt. 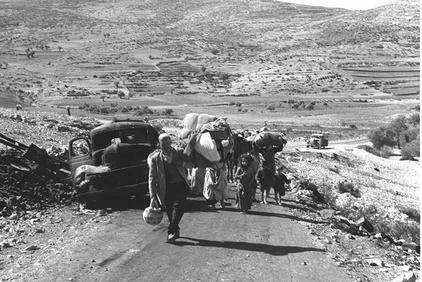 Almost a million Palestinian workers and peasants were driven out of their homes. This time the bourgeoisie made a complete mockery of sacrosanct property rights, legality and other lies. Brute force, terror, massacre and extermination were raised to supreme law, in order to serve as a foundation for all subsequent legislation. It is hardly necessary to describe the miserable conditions under which the Palestinian masses were herded together. Their situation was no less enviable than that of the hundreds of thousands of Jews who had just emerged from concentration camps to be shipped off to Palestine where imperialism dangled the vision of Eden rediscovered before their eyes. But it is certain that these million Palestinians, uprooted and condemned to unemployment, would disrupt the fragile regional equilibrium for all time and become the epicentre of social revolt in the Middle East. In spite of the determined attempts of the Israeli authorities to expel the greatest possible number of Palestinians - and their efforts were successful for the most part - a minority managed to stay put. In 1948 there were about 170,000 and today there are more than 500,000 Palestinians living within the state of Israel. This population has suffered unspeakable oppression such as perhaps has only been equalled in the African colonial societies. The Palestinian population has had to suffer under the dictatorial yoke of an extraordinarily fierce military regime, whose only «legal» foundation is provided by the famous British decrees from the time of the mandate, among which should be noted the Emergency Defence Regulations, drawn up in 1945 to combat the movements of Jewish resistance to the English occupation. the question is as follows: will we be subject to official terror or will there be individual freedom? No citizen is protected from life imprisonment without trial (...) right to appeal has been abolished (...) the powers of the administration to exile anyone at any time are unlimited (...). It is not necessary to commit any offence; a decision made in some office is enough. the order established by this legislation is without precedent in civilised countries. Even in Nazi Germany such laws did not exist. These declarations were made at a meeting of lawyers held at Tel Aviv on February 7, 1946 in order to protest against repression... English colonial repression; the first by Bernard (Dov) Joseph, later Israeli Minister of Justice, and the second by J. Shapira who became Procurer-General of the Israeli republic.6 A short two years later this nazi barbarity was employed by the Zionists against the Palestinians. But this barbaric legislation was not enough to satisfy the voracious colonialist appetite of Israel, this monstrous offspring of the reactionary union between Zionism and western capitalism. The terrorist arsenal of the Defence Regulations still had to be perfected, and this was done through a series of laws which under cover of the state of war, legalised the plundering of the Palestinians. anyone who in the period between November 19, 1947 and May 19, 1948 was owner of a plot of land situated in Israel and who during this period was either: 1) a citizen of Lebanon, Egypt, Saudi Arabia, Jordan, Iraq or Yemen; 2) in these countries or anywhere in Palestine outside Israel; 3) a Palestinian citizen who has left his place of residence in Palestine to take up residence in a region held by forces which fought against the establishment of the state of Israel7. This period coincides with the movement of large numbers of individuals who had fled the zones of the most heated confrontations. How many peasants considered absentees when they had only been displaced a few hundred meters, saw their lands confiscated? Another virtue of this law was that it seized the lands of the clergy (more than 6 %). God himself was an absentee! Another legal monument is the famous emergency law, It allows certain regions to be declared closed zones, and a written authorisation from the military government is necessary to gain access to it. According to another clause, if a village is declared a security zone the inhabitants no longer have the right to live there. More than a dozen villages in Galilee have had to be abandoned for this reason. Such is the law! More laws of the same kind have been enacted. While one such law authorises certain regions to be declared temporary security zones, which means that the peasants are prevented from cultivating their land, yet another law authorises the state to confiscate lands not cultivated for a certain period of time. Nothing escapes the law! The state completed this magnificent legal edifice with the Ordinances on the State of Emergency of 1949, intended to supplement the English emergency laws of 1945. They give full power to the military authority to meet public security need, to search homes and automobiles, to issue arrest warrants, to conduct in camera summary trials without right of appeal, to restrict individual freedom of movement, to impose house arrest and to deport anyone. For example, article 119 authorises confiscation of land, while article 109 empowers the army to bar anyone from designated areas and to dictate restrictions regarding personal contacts and employment. Here we have the explanation of one of the secrets of democracy; it can afford the luxury of concealing the overt violence of class oppression - compounded by racial and national oppression - with the hypocritical veil of legality8. These are the methods employed by Zionism to clear the land of its inhabitants on behalf of capital. The expropriation of the Palestinian peasants is almost complete in the territories seized in 19489. The scarcity of land even extends to the towns and villages where the population is cramped and land set aside for construction is extremely limited. Source:Annuaire statistique d'Israèl. 1955 to 1973. It is important to note that almost all Arabs employed in the industrial sector are wage labourers. Of the active agricultural population 58 % are proletarians, which means that in 1972 less than 10 % of Arabs in Israel were bound to the land. The services employ a large majority of wage labourers, to the point that in 1970, workers and assimilated represented 72.6 % of the active Arab population10. The new generation of Palestinians living in Israel is thus essentially working class although it continues to live in a rural environment (74 % of the population in 1967). The villages where they live are nothing other than ghettos in which the state of Israel seeks to imprison them. These overexploited and underpaid workers - in some cases they are paid half as much as a Jewish worker for the same amount of work - are forced to make hour-long trips to and from work in packed buses. no matter what rights and liberties might be accorded by law or by custom to the inhabitants of Israel, considerations of security can always call them into question without any formal departure from legal procedure12. Recently the few remaining peasants have again been victims of the arbitrary application of terrorist legislation. Thus in 1976, under the banners of a land consolidation operation, 24,700 acres of land were snatched from the Arab population. This attack on the meagre niche remaining to them led to mass demonstrations, strikes and confrontations with the police and the army. The latter decreed a curfew and invaded numerous villages. Six Arabs were killed and dozens injured. The episode was baptised day of the land. In particular, this legislation is used today against any challenge to the state. And who has the most to challenge if not the working class? The working class, since 1967 in contact with the new wave of Palestinian workers living under a regime of occupation on the Gaza Strip and on the West Bank, has awakened to the struggle with a boldness that compensates for the length of time it has been containing its anger13. Palestine is altogether a very small territory. With 27,000 square kilometres it is about the size of Belgium. A third of it is desert, cultivation is very difficult and particularly costly. In 1948 Israel occupied nearly 21,000 square kilometres. Obviously such a diminutive framework could not satisfy the voracious appetite of Zionist capital. In such a context, expansion is a necessity, and expansionism the state religion. Consequently in 1967, Israel occupied the West Bank and the Gaza Strip, and the scenario of 1948 was repeated. In 1967 the Gaza Strip was inhabited by 450,000 Palestinians. Two-thirds of these (376,775 in January 1967) were refugees who had come from the fertile plains around Jaffa after their expulsion in 1948. More than 100,000 inhabitants of the Gaza Strip, many of whom were forced to emigrate for the second time, had to take refuge in neighbouring countries. The West Bank, which before the 1967 occupation was inhabited by about 850,000 people, contained only 650,00 persons three years later; this means that more than 200,000 Palestinians from the region had to abandon everything and to settle in the concentration camps euphemistically called refugee camps. For one reason or another more than 300,000 human beings were forced to give up their homes and thus lost their right of return under Israeli legislation, designed solely to clear the land. The infamous law on absentees has done its share-it has affected more than 80,000 acres. Of the lands belonging to the state or to collectives, 16 % passed into the hands of those occupying them. Israel also requisitioned more than 10,000 houses from the so-called «absentees» who had been transformed into refugees in the camps. This is the usual procedure. Other more refined plans have been imagined. In the town of Akraba on the West Bank for example, the Zionists destroyed the crops by spraying them with chemicals. It need not be added that the Israeli state deployed its whole well-known terrorist arsenal. According to the declaration made personally by the defence minister at the time, Shimon Pérès, to the Knesset, several thousand Palestinians were expelled. Between 1967 and 1973, 23,000 Palestinians were incarcerated and between 1967 and 1971, as a result of the highly Biblical principle of collective responsibility, 16,312 houses were destroyed. Several towns - Latrun, Amwas, Yilo and Beit Nuba and many others - were simply wiped off the map. In October 1967, colonisation was begun on the lands which had been confiscated through state-organized gangsterism. In 1971 there were already 52 settlements on the recently occupied territories14. Since then new settlements and new projects have continued uninterrupted, and they periodically crop up in the news15. It goes without saying that the Arab population in this area, even more than in Israel, is denied any possibility of expression, of trade union or independent political association. For thousands of Palestinians, suspicion of membership in a subversive organisation has already earned them a total of several centuries in Zionist jails. Of a total population on the West Bank and the Gaza Strip, estimated in 1970 at almost a million inhabitants (and probably much more today in spite of the massive emigration to the petroleum producing countries) apparently more than 100,000 Palestinians go to work in Israel every day. In 1973 one in every three workers and one in every two wage-labourers living in these zones crossed the border daily. Considering the fact that the process of proletarianization has continued in these zones while the local labour market has stagnated - if not shrunk - the proportion is undoubtedly higher today. Source:Jamil Hilal, Les Palestiniens de Cisjordanie et de Gaza, Khamsin no 2, 1975, p. 51. Israelis: Jews and Arabs combined. This discrimination is compounded by the open theft practised by the Israeli state. The Palestinian worker has practically 40 % deducted from his wages in the form of various taxes, a rate much higher than the deductions made from the wages of the Israeli worker, who in addition is eligible for certain benefits, such as social security, unemployment insurance, paid vacations, retirement pension, etc., whereas the Palestinian worker in the occupied territories is not. These taxes are a veritable tribute that the worker is obliged to pay to the state while he works in conditions of total insecurity. The Arab nationalist newspapers may often fill their columns with disapproving remarks about Israel: They are stealing our workers. The Palestinians workers endure the double oppression and the double exploitation existing in Israel for the simple reason that the wages paid by the Arab bosses are even more miserable than those paid by their Zionist masters. It is all but impossible for a Palestinian bourgeoisie, lacking any backbone and mettle, to compete with Zionist capital. In the best of times it acts as the latter's lieutenant, grumbling all the while. Consequently the Israeli bourgeoisie, attracted by the cheap labour power on the Gaza Strip and the West Bank, often concludes agreements for subcontracted labour. Both bourgeoisies rake off the fat. The Israeli bourgeoisie profits from the low wages that the Arab employers succeed in imposing on the workers, and it can defuse the lame fits of opposition by the Palestinian bourgeoisie, which «flourishes» on the steady business. At the time of the war in 1948 the Palestinian struggle had not yet recovered from the shock suffered in the defeat of the revolts of 1933 to 1936, and therefore the resistance was rather weak. The unleashing of the six days war by Israel as well as the anger provoked by the cowardice of the Arab governments led to massive revolts and the arming of the Palestinian population. And it was precisely the al Fatah which assumed the task of fettering this movement in a programme that preserved the existing Arab states. The wave was sufficiently strong to permit a certain radicalisation, which led to the formation of organisations that employed a more «proletarian» vocabulary and to a fusion of the interests of the Palestinian-Jordanian masses on the one hand and the Palestinian-Lebanese masses on the other hand. The intent of this article is not to sketch a history of this revolutionary wave, unfortunately deprived once again of the support of the proletariat in the large imperialist centres, openly combated by all the Arab states, delivered to its executioners by the very orientation and principles of the various parties in its leadership, which along with the Arab states finally prostrated themselves before the international and local established order. The important thing to understand is that the next revolutionary explosions will come forth in social - and political, too, we hope - conditions vastly different from those of 1948, and even those of 1967. The net social result of the bloody primitive accumulation of capital in Palestine is approximately as follows. The Palestinian refugee population which is not subject to Israeli rule amounts to over 2.3 million persons (60 % of all Palestinians). It is naturally without any ties to the land. Of this mass of refugees only 40 % of those of working age have jobs, and the large majority of those employed are wage labourers (in 1970, 73.2 % of Palestinians working in Lebanon, 79.3 % in Syria, 89.6 % in Kuwait), a significant portion of them blue-collar workers. Thus the population is largely proletarianized16. Among the million and a half Palestinians (that is, 40 % of all Palestinians) living under the Zionist heel, only a minority still possesses land. The number of employers and self-employed workers in the agricultural sector fell from 37,000 in 1969 to 26,100 in 1973 on the West Bank and from 6,200 in 1970 to 4,600 in 1973 on the Gaza Strip. The figures have fallen even further in recent years17. The expropriation process continues and consequently may still provoke agrarian unrest and revolts, particularly in a period of economic crisis, given that in the whole region the Arab working class population is not significantly urbanised and still lives in villages transformed into dormitories18. On the West Bank the workers formed 47.5 % of the active Palestinian population in 1973; 55.6 % on the Gaza Strip. In Israel the proportion is probably about the same since 72.6 % of the Arabs are wage labourers. But all these Palestinian proletarians are more often agricultural and construction workers than industrial workers. In spite of the hypocritical excuses and fallacious justifications of the Israeli and European and American imperialist bourgeoisies, it is not difficult to imagine the degree of oppression suffered by the half million Palestinians dwelling in a state where there is already social discrimination between Jews of occidental and oriental origin, where nationality is based on Jewish nationality, itself based on religion, a state which is moreover permanently at war with the neighbouring Arab states. But these Palestinians whom the state differentiates further according to religion into Christians, Druses, or Muslims, are at least theoretically entitled to the same economic and social rights as the Jews of Israel. As for the Palestinians on the West Bank and the Gaza Strip, their plight is even more frightful since they are openly in a state of siege19. The broad Palestinian masses, thanks to whose labour the orchards of Israel blossom today and to a growing extent the factories of Tel Aviv and Nablus hum, cannot continue to live and defend themselves without fighting capitalism, on the terrain shaped by capitalism itself. Their struggle immediately comes up against the political and racial discrimination connected with Jewish privilege, in short against the colonial nature of the state of Israel, which more and more uses against the workers' struggles the very laws it utilised yesterday and continues to utilise today in the occupied territories to transform the peasants into proletarians. For the modern proletarians, these discriminations and this servitude based on race and religion are even more intolerable than in any other society, and they amplify the immense potential of social revolt fed by capitalist exploitation and the political oppression that flows from it. In the ground below the slave democracy of Israel there are already accumulating the white-hot substances of an eruption much more violent than those caused up to now by the powerful shocks of expropriation of the Palestinian peasants. These are the substances of proletarian class struggle which the emigrated Palestinian workers will help extend through the whole region and which, in conjunction with the working class of the large imperialist centres, will succeed in breaking the social front of Jewish solidarity in Israel, drawing the Jewish proletarians into its impetuous course and taking the lead of the poor peasant masses in revolt. And this struggle is a fight to the death against the local and international established order, which can only be broken definitively by the victory of the world communist revolution. 1. Marx, Capital Vol. I, ch. XXVI, «The Secret of Primitive Accumulation», Moscow, 1954, p. 668. 2. Marx, Capital Vol. I, ch. XXVI, «The Secret of Primitive Accumulation», Moscow, 1954, p. 669. 3. See particularly Lorand Gaspard, «Histoire de la Palestine», Paris, 1978, p. 140. 4. See Nathan Weinstock, «Le Sionisme contre Israël», Paris, 1969, pp. 179-80. 5. Robert Somers, «Letters from the Highlands or The Famine of 1847», London, 1848, quoted in Marx, Capital Vol. I, ch. XXVI, «The Secret of Primitive Accumulation», Moscow, 1954, p. 684. 6. Nathan Weinstock, «Le Sionisme contre Israël», Paris, 1969, p. 392. 7. Sefer Ha-Khukkim (Principal Laws) 37, 1950, p. 86. 8. For a complete picture of this legislation we refer the reader to the following works: Nathan Weinstock, «Le Sionisme contre Israël», Paris, 1969, pp. 374-399; Lorand Gaspard, «Histoire de la Palestine», Paris, 1978, pp. 187-189; and Sabri Jiryis, «The Arabs in Israel», N.Y., 1976, pp. 89-102. See also «Problèmes éonomiques et sociaux», no. 199, Paris, Nov. 2, 1973. 9. Of the 475 Arab villages that existed in Israeli-occupied Palestine in 1948, today only 90 remain. The other 385 have been wiped off the map by dynamite and bulldozers. 10. See the articles by Lazare Rozensztroch and Jacqueline Farhoud Iraissaty in the review Khamsin, no. 2, 1975. 11. On October 29, 1956, Israeli soldiers entered the village of Kfar Kassem to decree a curfew. They announced to the villagers that anyone still found outside his house in a half-hour would be executed. Several villagers still working in the fields and on Israeli jobs outside the village at that hour could not be warned, when they returned the Israeli soldiers stopped them, lined them up and shot them: forty-seven villagers were assassinated. The state of Israel opened an inquiry and passed sentence on those responsible. In 1960 the second ranking officer found responsible for the massacre was placed «in charge of Arab affairs» in the region of Ramleh, not far from Kfar Kassem. 12. This is how «Problèmes éonomiques et sociaux», no. 199, Paris, Nov. 2, 1973, summarises the meaning of commentaries by Sabri Jiryis in his book on the subject. 13. «Orders of forced residence, of house arrest, of expulsion or detention by decree are given by the dozen, but these measures affect only Arabs (...) The same discrimination is to be found in the attitude of the authorities with respect to the freedom of the press and freedom of association. Until now no Hebrew newspaper has been suspended and no Jewish political association has been prohibited, no matter how extremist they may be and no matter how distant they may be from the attitude of the regime. On the other hand, no Arab journal can be published in Israel unless the authorities can count on the support or at least the complicity of those responsible for it. No Arab organisation has been authorised to participate in any activity without the consent and total approval of the authorities.» Sabri Jiryis, «Democratic Freedoms in Israel»,«Problèmes éonomiques et sociaux», no. 199, Paris, Nov. 1973. This passage illustrates the oppression suffered by the Palestinians, but it is certain that the same laws will be applied with the same severity to any Jews who go so far as to break the social front of Jewish solidarity on which the hypocrisy of Israeli democracy rests. 14. Lorand Gaspard, «Histoire de la Palestine», Paris, 1978, p. 145. «south of the town of Nablus, and covers 198 acres of land, property of the Arab residents of the sector who were expropriated by the Israeli government following a decision of the supreme court justifying the act for «defence» reasons. The bulldozers began to open up access roads. The few dozen future inhabitants, of the village arrived on board army vehicles». On Sunday June 17, a major demonstration against the establishment of this colony took place at Nablus, provoking the intervention of the Israeli army which was greeted by a shower of stones. 17. See Jamil Halil, «Les Palestiniens de Cisjordanie et de Gaza», in Khamsin, no. 2, 197S, pp. 46-68. 18. In its number of May 29, 1979, the daily «Asharq Al-Awsat» appearing in London, reported that the inhabitants of a Jewish colony in the Sinai called Ofera, after having been dislodged from the Sinai by virtue of the Israeli-Egyptian treaty, tried to occupy the Arab village called Maalia in Galilee. The colonists appeared at the village with their furniture, their tools and their tractors and their banners read «Galilee in exchange for the Sinai» and «Ofera promises not to let a single Arab live in Israel». The Palestinian population tried to hold discussions but the colonists replied by showing that they had been officially mandated by the Jewish Agency to take over the village. A lively argument ensued; one colonist shot several times over the heads of the Arab delegates in order to intimidate the villagers. Immediately dozens of inhabitants of the village ran up. The ensuing brawl lasted more than 2 hours and afterwards the colonists were forced to pick up their belongings and take flight, leaving their huts in flames. When the police arrived they asked: «Did al Fatah give you the order to shoot at the Jews?» The villagers answered the police interrogation with a general strike. The government, surprised at encountering spontaneous resistance, retreated and declared over the airwaves that the state had not been implicated in the operation, responsibility resting with the colonists alone, and that it had not even been informed of their intentions! Once again, force must be opposed by force alone. 19. If an illustration of this fact is necessary, Le Monde of June 6, 1979 reports that on Monday June 4, in the middle of the night the houses in which four Palestinian lived who were suspected of belonging to the resistance were encircled by the army; «the families received the order to leave the premises immediately. The furniture was taken to the garden of El Jenieh, the house of the parents of Mell Ataf Yussef was razed by a bulldozer, At Ramalleh and El Birch, three apartments were walled in after their occupants had been evacuated. The doors and windows were blocked by a partition of bricks and cement,» The entire arsenal of terrorist laws is thus quite alive and in particular the laws on collective responsibility.